Stickies with tablet support and reminders. Is there a better alternative to SketchBox? Is SketchBox really the best app in Desktop category? Will SketchBox work good on macOS 10.13.4? 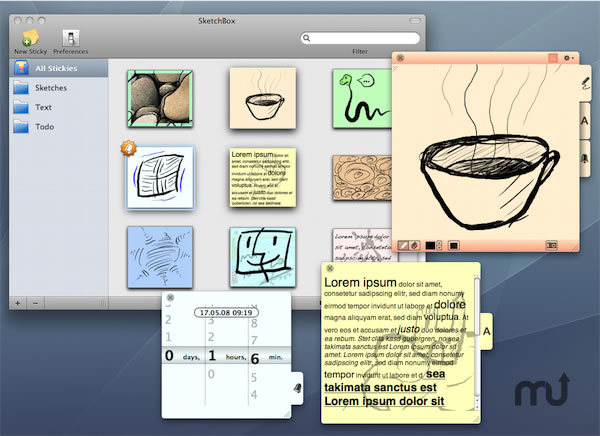 SketchBox is a Sticky Notes Manager that supports graphical and text notes that can be used as reminders. Notes can be arranged via drag'n'drop in the thumbnail view to create little storyboards or comics. Each Sticky consists of three layers: The drawing canvas, a little text editor and an intuitive alarm timer that combines analog and digital elements. While editing text the drawing layer is still visible in the semitransparent background and vice-versa. SketchBox is designed not to interrupt your workflow. You can close Stickies at any time and they will remember their position on screen and their content without bothering you with a save panel. Closed Stickies are always accessible via the thumbnail view. You can stick individual notes to the Desktop if you don't want them to clutter ExposŽ or make them appear always on top for important things. The drawing canvas has extensive support for graphics tablets with pressure sensitivity and you can use the backside of your pen as an eraser. Save your creations as a PNG file with alpha channel or just copy them over to other applications. SketchBox also works great as a reminder. You don't have to enter numbers, just wind up the clock with your mouse by dragging or using your scroll wheel.